Last week I got an email from Beth asking me if I was interested in the Around the World Blog Hop. Since I enjoy reading other people's answers to these kinds of questions I said that I would love to participate. But these questions are hard to answer! Right now I am working a project inspired by the fabrics in Hadley. There are a few prints from the collection included, plus lots of other Denyse Schmidt prints and a few others. It is a little out of my comfort zone, but a lot of fun. 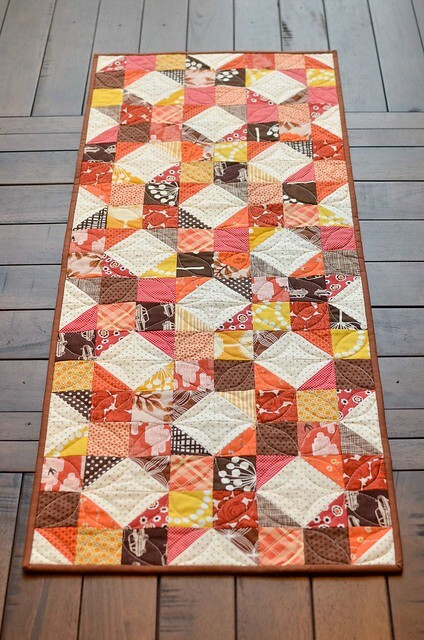 The quilt is made up of 9 patch blocks and churn dash blocks set on point. I also pulled fabric today for a baby quilt for a friend of mine. She has a very minimalist style so I am not quite sure where I am going to go with it, but I think it will involve a lot of white, blues, and grays. I have no idea how to answer this question because I feel like I am still trying to find my own style. I know that I always want to be trying new techniques and sewing with new colors. My favorite thing is to have a stack of fabrics and then try to figure out the best pattern to use them with. That's the best. This is something I have been thinking about lately. I really like to throw myself into projects. Quilting is particularly rewarding because when I am done working on a project I have something substantial to show for it. As much as I love being a wife and a mother, it is important to be my own person and quilting is a great way to express that. I also enjoy that quilting has both an analytical and a creative side. There are so many different places to be inspired, but I usually start by looking at books or magazines Sometimes I will find an idea, but usually this just helps me to focus my ideas and narrow things down. Sometimes I just start cutting fabrics. I will usually change my mind and those pieces will end up in the scrap bin, but sometimes that sparks an idea. I used to do a lot of sketching on graph paper, but I have been using EQ7 lately and now I keep a folder of saved projects on my computer that I can look through when I need an idea. Usually I end up changing and adapting the idea to fit my current project, but that helps spark something. I am nominating Amanda from The Cozy Pumpkin. I think I was supposed to nominate 3 people, but Amanda is so great she can count as all three :) Watch out for her post on Monday September 8th. Interesting that you feel you're still figuring out your style. I feel the exact same way. Although when I see a quilt by you I always think...that's so Erica! lol So you definitely have a style! 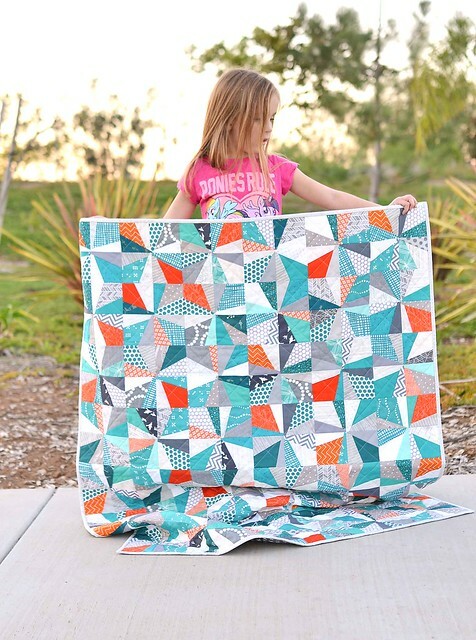 Your Hadley quilt looks so great!!! Very autumnal. I found the how am I different question awfully tricky too and have no idea what my style is. 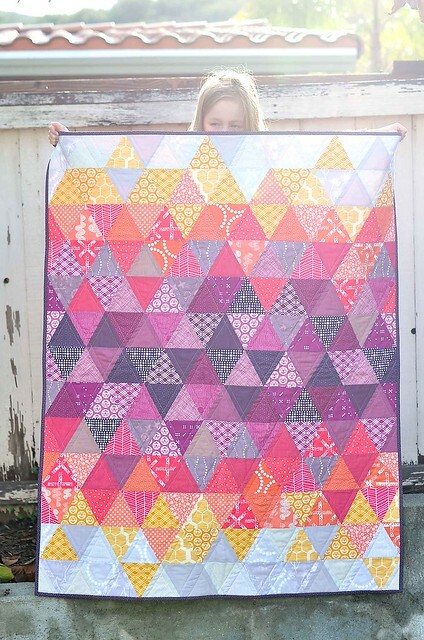 I love the way you use colour in all your quilts here. They all seem to work so well! All your photos/projects are gorgeous! And it was great learning more about you. I so loved reading more about your creative process, thanks for sharing. The quilt you're working on is beautiful. I just love all of your work!